Ackee, Jamaica’s national fruit, is the delicious partner in the famous Jamaican national dish duo ‘Ackee and Saltfish’. Ackee, derived from the name Ankye which comes from the Twi language of Ghana; it was imported to the island from West Africa by the captain of a slave ship in 1778. It was given the botanical name, ‘Blighia Sapida’, in honour of Captain William Bligh, who took a few samples of the fruit across the Great Ocean separating our lands, to Kew Gardens, South London, England in 1793. Since its official entry to our island, the seeds of the fruit have taken root and ackee trees are now abundant, bearing large quantities of the fruit annually. In favourable conditions, the ackee tree can grow up to 15.24 m (50ft), bearing a fruit with a skin that turns red when mature. Once ripe, the fruit bursts open revealing three black seeds surrounded by yellow flesh. At this point, the fruit is ready to be harvested. 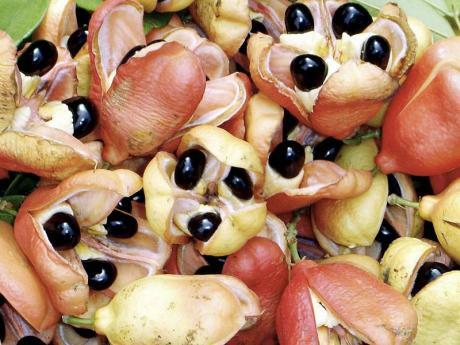 There are two main bearing seasons for ackee: between January to March and June to August. Ackee can be enjoyed at breakfast, lunch and dinner; in fact, many have begun cooking it with pork or mackerel (salted or tinned) serving the combinations as a spontaneous dish. Although the fruit is not indigenous to Jamaica, it has helped to shape the culture of Jamaican food: ackee soup, ackee pizza, ackee quiche and even ackee punch are some meals that have become a commonality in Jamaica. The canned product is exported to markets worldwide and has become a way of connecting the diaspora to our island, as residents abroad are still feeling the ‘island vibes’ by seasoning and cooking ackee within their homes. This national fruit has truly brought together both tourists and native Jamaicans on our great island. Please join us next week, where we will discuss the health benefits of ackee. Our National Dish – What’s In It? Written by Gabrielle Brown, student of Campion College. Edited by Kaeonna Walters. This post appears courtesy of the Do Good Jamaica Professional Pathways high school internship program.